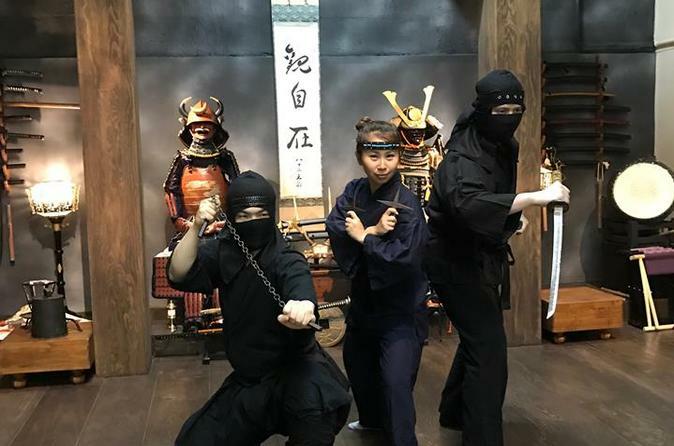 On this hands-on ninja experience tour, you will start with meditation in ninja outfit, and learn 3 to 5 entry level techniques with our ninja instructor. Nowadays, ninjas are striving to reach their goals, develop the individual persons and sensibility to survival. They protect others, stand up for freedom, and build a great community of friends. Our ultimate goal is to reach and follow the path to the ku or no-self, where there is no conflict. Start this journey of becoming a real ninja with us! Upon arriving at our dojo, you'll experience meditation and change to ninja gi (outfit for ninja students). During this 90-minute experience , you willz learn 3 to 5 entry level techniques with our ninja instructor. These techniques include: Meditation and Kuji-kiri (well-wishing), Embu (dedication to our ancestors), an Introduction to ninja weapons, an Introduction to meditation and Kujikiri, and 5 elective training techniques (stealthy steps, shuriken, blowgun, inner eye, sword, jujitsu, etc.). At the end of the tour, of course you will have plenty of opportunities to strike your best ninja pose and take lots of photos with your friends and our instructor! Your path of becoming of a ninja has officially started!